Chevrolet Malibu (A-body/G-body). 1978–83 (prod. 1,542,931). 2- and 4-door sedan, 5-door wagon. F/R, 3291, 3753, 3791 cm³ petrol, 4280 cm³ diesel (V6 OHV), 4375, 5001, 5714 cm³ petrol, 5737 cm³ diesel (V8 OHV). Downsized intermediate range, all models on a 108 in wheelbase, practical, fairly refined for the time, and good road manners. Name came from the higher-spec trim level of the previous Chevelle. Optional F-41 package improved handling (for V8 models only). Surprisingly, sedans and wagons had fixed rear windows, with swing-out vents. 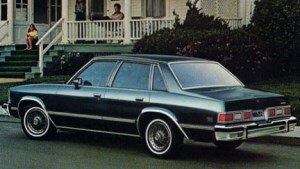 Mid-term changes for 1981, with sedan adopting a more formal appearance and a four-light body, closer to that of the 1980 Buick Century. Diesels for 1982, but Malibu seemed like a car of the past as Chevrolet Celebrity launched that year. Respectable sales for 1983, but cancelled in favour of the Celebrity.